It just struck me how great it would be if Ohio based band National Steam put out a single or an EP with "The Sutler" and "Ode To Death" off their fine 1998 CD debut on Eternity's Jest records - it certainly would make a nice collector's item and an immortalised slab of fine sounding gothrock too. The band's brooding and dark sound is reminiscent of Tangerine Dream ca. "Alpha Centauri" and "Phaedra" and Peter Hammill's better 70's and 80's output with and without Van Der Graaf Generator ca. 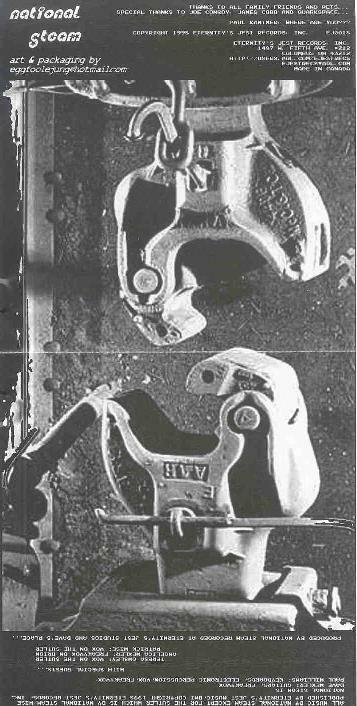 "Still Life", "In Camera" and "Nadir's Big Chance", as well as the music from the first "Alien" movie. Spooky synths bring to mind The Legendary Pink Dots ca. "Legendary Pink Box" with some guitarwork leaning a little towards Huw Lloyd Langton's classic 80's stint with Hawkwind on albums like "Sonic Attack" or "Xenon Codex", as well as echoes of early Sisters of Mercy ca. "First And Last And Always". I created all the art and packaging on this excellent CD for a mere $150 in payment plus promotion copies which I handed out on a local radio show I hosted some years back. I am always seeking more well paid illustration jobs in this field, as well as in the general art world, with my otherwise long background in mainstream and underground horror and humour comics and in the underground in general, both as a writer and an artist and a painter, as well as other paid production and technical work with major publishers and film studios. 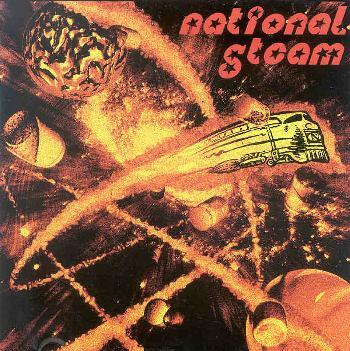 The front cover illustration of National Steam's debut CD shows a fiery train blasting through space. The art was scanned and recreated in Photoshop with Kai's Power Tools and a lathe renderer through several photo filters for a faded and grainy 3D look, while the inside booklet photo remains a worthy black-and-white tribute to the SST-patented style of the early SubPop label. 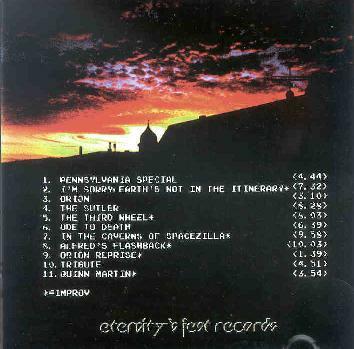 The eerie back artwork is a moody photo of the fiery summer evening skies over Oslo's west side, a rusty Commodore 64 computer-style lettering for the track listing expressing the moody and epic style of the album. A portfolio of my work can be seen at http://bloomingdales1383.tripod.com/eggfoolejung/index.html. For inquiries contact me at superskrull666@yahoo.co.uk. For more information on National Steam and its mothership band, Quarkspace, visit: http://quarkspace.com.